Each $94 box contains 24 packs. Each pack contains 9 cards. Legacy of the Valiant lets Duelists infuse their decks with the strength of the very land itself. Excavate new strategies from the tombs of the ancient kings, with the biggest batch of Gravekeeper cards since 2010's Structure Deck Marik. Unearth astonishing new game mechanics with a brand new Plant theme like you've never seen before, guaranteed to turn your Duels upside-down. Following their re-introduction in Shadow Specters, Legacy of the Valiant includes new Monarch cards, including a Ghost Rare version of the brand new Mobius the Mega Monarch! 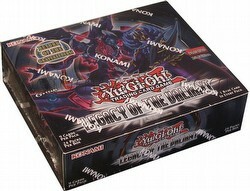 Plus new cards for Bujin, Chronomaly, Ghostrick decks, and much, much more. The set includes 100 cards (48 common, 20 rare, 14 super rare, 10 ultra rare, and 8 secret rare).